Babies have an uncanny ability to make you silly. We’ve all experienced the strange, instantaneous transformation: you’re walking along, the picture of respectability, when you spot bright eyes and baby CHEEKS! It’s always the cheeks that really push you over the edge. Suddenly, you’re cooing, peekabooing, vroooooming airplane spoons . . . anything for a smile, or best of all, a baby giggle! My friend Amelia knows all too well what one will do for a baby. Her little Rowan (now 6 months old) wasn’t tolerating dairy very well, so mama had to give it up! No tall glasses of milk, no cheesy pizzas, no gooey lasagnas — and worst of all, hubby was still able to chow down! I’m going to be honest (with apologies to vegans out there): I would not be a fan of a dairy-free lifestyle. I enjoy meat, but I’d be much quicker to give it up than my beloved cheese, butter, and milk! Amelia’s a champ, though; with nary a complaint, she’s gone almost completely dairy-free for months. She deserves a mommy medal, but perhaps she’d settle for a loaf of vegan pumpkin bread? I first spotted this beauty on Joy the Baker awhile back, when Joy admitted to sometimes searching for vegan recipes just because she’s out of butter or eggs. I love the honesty, not to mention the resourcefulness. A girl after my own heart. Gotta have sweets and gotta avoid the mid-recipe grocery store run. 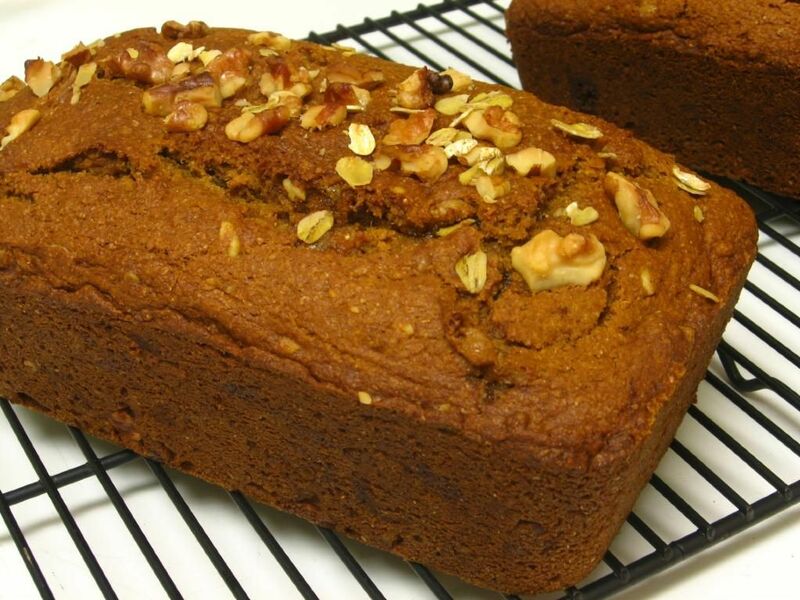 This pumpkin bread was nice and moist, with a deep caramel-esque flavor from the brown sugar and maple. I added oats for more heartiness. One loaf went to Amelia, and Mike and I kept one for breakfasting. We defiled our loaf by slathering it with butter (more apologies to the vegans! ), but it’d be delicious spread with cream cheese (oh wait! sorry vegans! ), peanut butter, pumpkin, maple syrup, vegan margarine, mud . . . it’s just good! Just spread it with something creamy and suited to your dietary leanings, and consume! 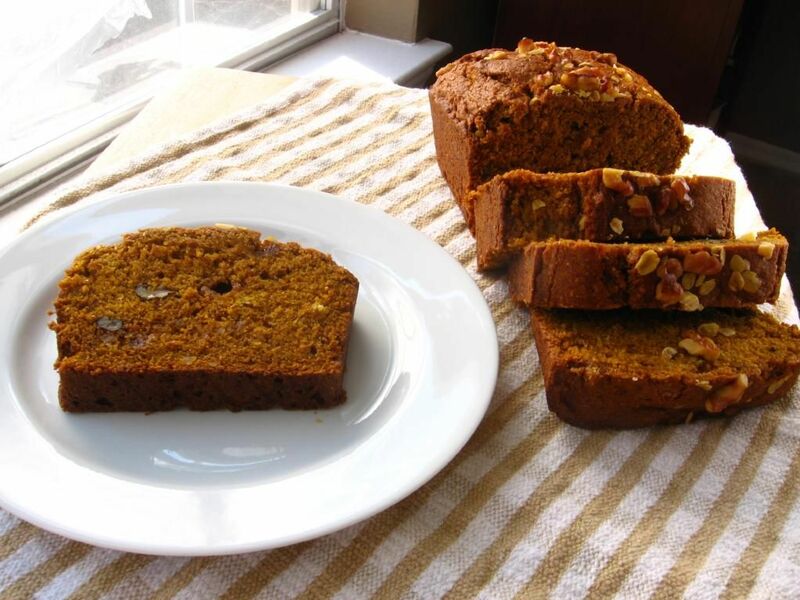 I will say that it wasn’t as grand, in my tastebuds’ opinions, as regular old pumpkin quick bread. I think I prefer a brighter pumpkin spice flavor to the depth of the maple and brown sugar combo in this recipe. Nevertheless, if you’re out of eggs, following a vegan lifestyle, or simply avoiding dairy for a cute little imp of a babe, this is a nice, hearty option. We have the last bit of our loaf sitting in our freezer waiting for Saturday morning breakfast! Preheat oven to 350 degrees F. Place a rack in the center of the oven. Grease and flour two loaf pans and set aside. In a medium bowl, carefully whisk together pumpkin puree, oil, maple syrup and water. Add the wet ingredients to the dry ingredients and use a spatula to fold all of the ingredients together. Make sure to scrape the bottom of the bowl well, finding any stray flour bits to mix in. Fold in most of the chopped walnuts and oats, reserving some to sprinkle on top of the batter once in the pan. Serve warm. To freeze, double wrap in plastic wrap and then wrap in foil. I am so with you re: the pain of losing dairy vs. meat. It’s no contest for me either. Both of my friends who just had babies have been dealing with the dairy problem too. One is the most diehard cheese fan I’ve ever met, so I totally feel for her and Amelia! And of course, your bread looks awesome, as always. Thank you, Mary Beth! The dairy-free thing would be ridiculous for me. There are just SO many delicious cheeses to make every dish its own special brand of creamy, gooey, and flavorful. I guess it helps to have a sweet baby reminding you every day why you’re giving it up! 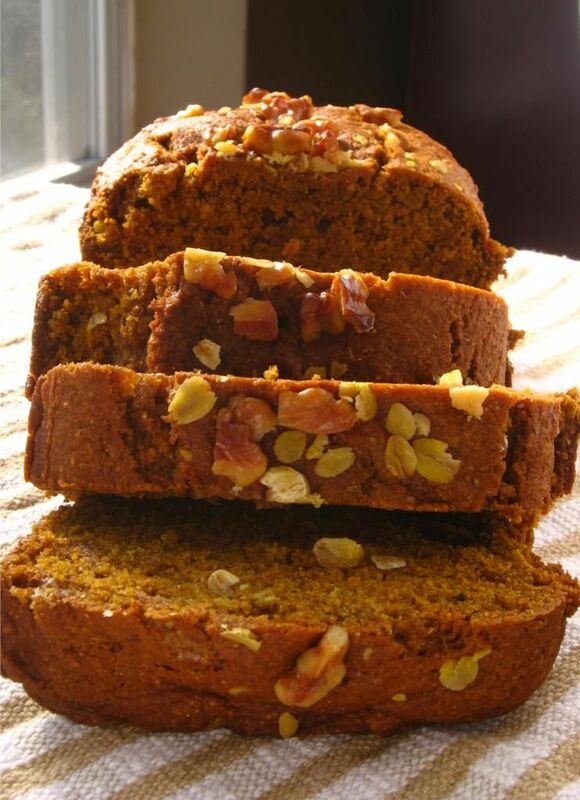 I love pumpkin, and especially pumpkin bread and yours looks delicious! I love the deep pumpkin color in the sunshine! mmmm! yum! I’ve been thinking about making Joy’s recipe too, since I seem to have a can of pumpkins still in my pantry from the holiday season. Thanks for the extra inspiration! Thanks, Laura! Hope you love it! Julie, you’re such a sweet friend finding recipes like this! 😀 She must have been very happy indeed! Does this recipe have to include the whole wheat flour. 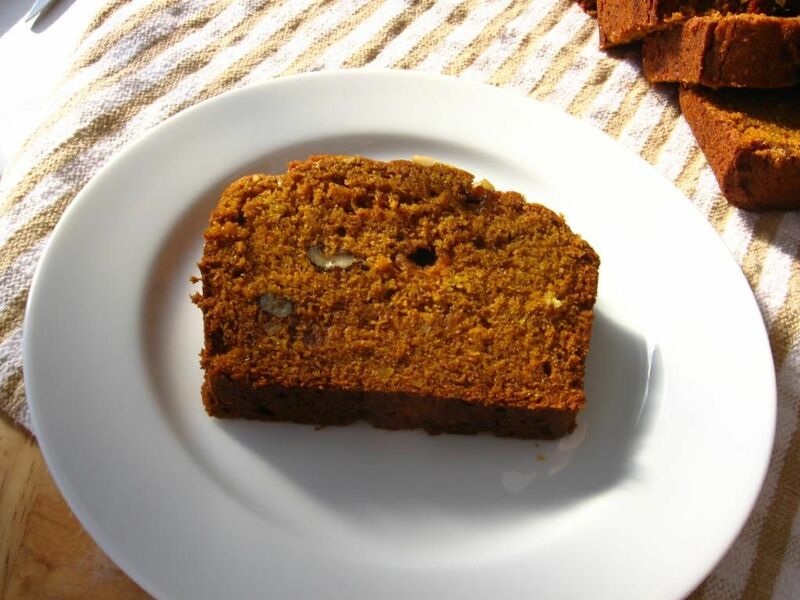 Can you provice a recipe for a non vegan pumpkin loaf recipe. My 17yr. 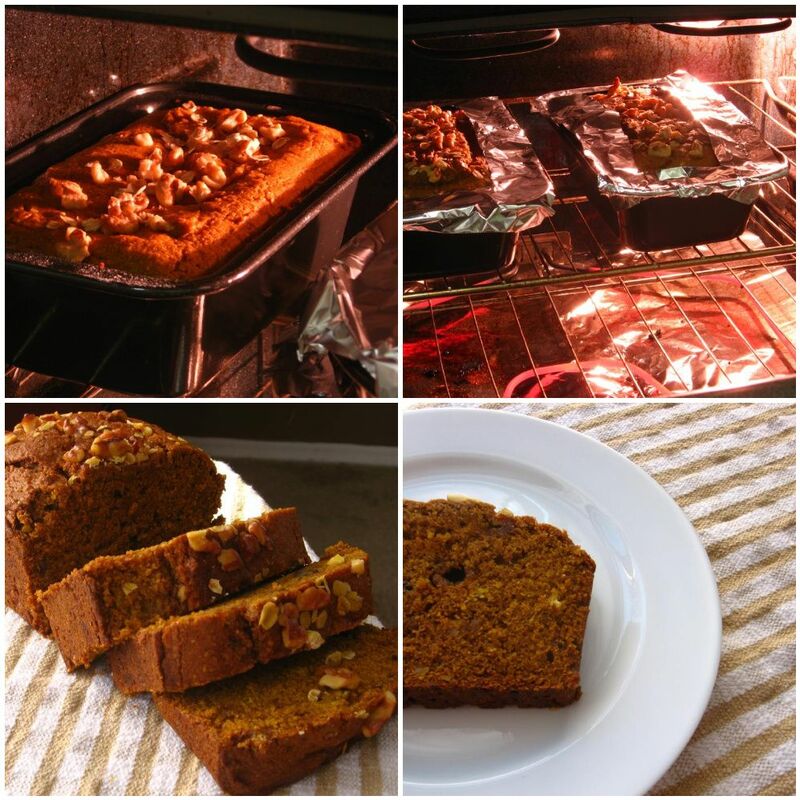 old son is craving a pumpkin nut loaf and by far this recipe looks totally fab!!!!!!!!! I typically love Libby’s recipes! Oh my goodness… I made this tonight, because I wanted to take something to my new neighbors. They may not get it. It is SO good. I made it into muffins, because it’s easier to transport, and they are Ah-mazing. Thank you for this recipe! Aw, yay! So glad you love it, Nori! Baking it into muffins is a great idea! I trying my luck, baking the ” Vegan Pumpkin Walnut Bread” , I couldnt find any tin pumpkin puree, so I used fresh pumpkin , ( ofcourse I cooked it and then pureed it) using 1/2 kg , So its ready to go into the oven soon, Wish me luck ! !